Still on with our interesting series on “leftover makeover” inspired by some dishes we lifted from the pages of FOODIE magazine. This second dish I cooked for Studio 23’s “US Girls” was such a big hit that it was gone instantly before I could finish saying “bon appetit” to everybody! Simple, tasty to the core and very elegant, this dish should work its way on your menu soon. The leftover food was the pasta. 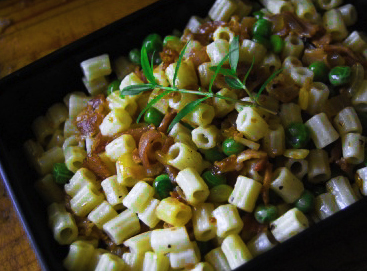 In this case, we used salad macaroni. 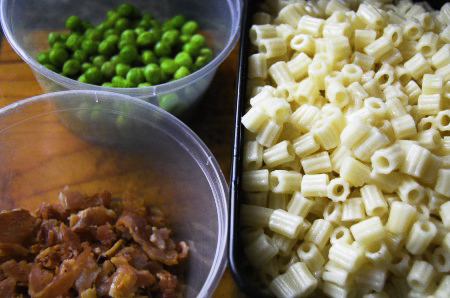 Have you ever had the experience of over estimating your pasta, cooking more than you need and ended up just stacking them away in the ref to grow those icky molds? Ha! Alright, let’s have some great-tasting solution to this leftover dilemma. The dish I made called for about 5 cups of cooked salad macaroni (cooked according to package directions), 2 tbsps olive oil, 2 tbsps butter, 1 medium-sized chopped white onion, 3/4 cup chopped bacon or pancetta, 3/4 cup frozen sweet peas (thawed), 2 tbsps dry white wine, salt and pepper to taste and grated parmesan cheese. I Sauted onion and bacon. Added wine and let alcohol evaporate before I mixed in peas which I had to saute a bit longer til I got it tender while still very bright green in color. Tossed them gently onto my pasta and sprinkled parmesan cheese on top. it’s easy and delish! I will have to make this soon even if it’s not leftover pasta! Hi, Peach! Easy no? Yeah, try it soon! i tried this recipe of yours. it did taste delicious, but somehow it was dry. maybe i did something wrong or next time, i should add a little pasta water. thanks for the recipes by the way. very interesting. i doubt that i undercooked the pasta. i guess i did not add enough olive oil. i will try this again though. thanks again for your delightful recipes. i have never tried philippino food, so i am excited to try your other recipes! Okay. Many thanks for stopping by. Happy cooking!